All transactions are safe and secure with a reliable history in online purchasing behind each of our associates. 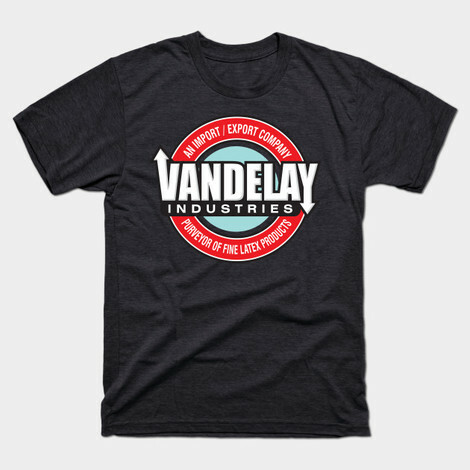 Buy the Seinfeld Vandelay Industries t-shirts to own Seinfeld clothing and merchandise. The design is also available on a Women's Vandelay Industries t-shirt. Vandelay Industries is a fictitious latex company that George Costanza creates from the pseudonym Art Vandelay. Assigning Jerry's phone number to the company, George uses the Vandelay Industries company name to convince the local unemployment agency that he is looking for work. This way he will still be able to obtain unemployment checks. The bestselling Vandelay Industries Seinfeld t-shirts on the left advertise the worldwide leader in latex. In addition to the Seinfeld Vandelay Industries tees above, browse the Seinfeld Clothing Gallery for more apparel like men's and women's clothes, kids shirts or hoodies.